A targeted area of skin is exposed to red, blue or infra-red light. In the skin , the light stimulates the cellular ATP which energises the cells. The stimulated cells are then able to heal and regenerate faster, produce collagen and elastin. Light also stimulates the blood vessels in the skin thus improving the cell nutrition and oxygenation, blood circulation and lymphatic drainage that carries away waste products. Red light only penetrates deep in the skin and is used to treat condition such as psoriasis, eczema , fine lines and sun spots. Blue light has less penetration but is very intense and is very effective in treating acne. It is the ideal treatment for people that do not want/or cannot use strong oral medication. 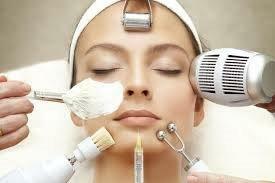 LED therapy can be used as a series of treatments(6 to 8 treatments one week apart) by itself or to enhance the effects of other treatments like Laser, IPL, Peels, Microdermabrasion. LED is used in conjunction with aminolevulinic acid (Photodynamic Therapy) to treat acne, solar keratoses and certain skin cancers.